For the former Secretary of Health and Human Services, see Louis Wade Sullivan. Louis Henri Sullivan (September 3, 1856 – April 14, 1924) was an American architect, and is often referred to as the "father of modernism." 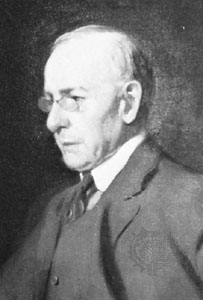 He is considered by many the creator of the modern skyscraper and was an influential architect and critic of the Chicago School. He is also well-known as being an important mentor to Frank Lloyd Wright and an inspiration to architects of the Prairie School. Louis Sullivan coined the phrase "form ever follows function," which, shortened to "form follows function," became the great battle-cry of modernist architects. Sullivan was the first to cope with the technical and stylistic crisis that came with the development of steel frame buildings. While his buildings could be spare and crisp in their principal masses, he often punctuated their plain surfaces with eruptions of lush Art Nouveau and something like Celtic Revival decorations, usually cast in iron or terra cotta, and ranging from organic forms like vines and ivy, to more geometric designs, and interlace, inspired by his Irish design heritage. Another signature element of Sullivan's work was the massive, semi-circular arch, employed throughout his career in shaping entrances, framing windows, or as interior design. 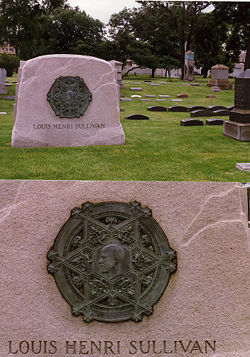 Louis Sullivan was born to an Irish-born father and a Swiss-born mother, both of whom had emigrated to the United States in the late 1840s. He grew up living with his grandparents in South Reading (now Wakefield), Massachusetts. Louis spent most of his childhood learning about nature while on his grandparent’s farm. In the later years of his primary education, his experiences varied. He would spend much time by himself, wandering around Boston, exploring every street and looking at the surrounding buildings. Around this time he developed his fascination with buildings, and he decided he would one day become a structural engineer or architect. While attending high school, Sullivan met Moses Woolson, whose teachings made a lasting impression on him, and nurtured him until his death. After graduating from high school, Sullivan studied architecture briefly at the Massachusetts Institute of Technology. Learning that he could both graduate from high school a year early and pass up the first two years at the Massachusetts Institute of Technology by passing a series of examinations, Sullivan entered MIT at the age of sixteen. After one year of study, he moved to Philadelphia and talked himself into a job with architect Frank Furness. However, The Depression of 1873 dried up much of Furness’ work, and he was forced to let Sullivan go. As a result, Sullivan moved to Chicago in 1873 to take part in the building boom following the Great Chicago Fire of 1871. He worked for William LeBaron Jenney, the architect often credited with erecting the first steel-frame building. After less than a year with Jenney, Sullivan moved to Paris and studied at the École des Beaux-Arts for a year. Later, he returned to Chicago and began work for the firm of Joseph S. Johnston & John Edelman as a draftsman. 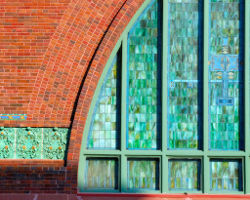 Johnston & Edleman were commissioned for the interior design of the Moody Tabernacle, which was completed by Sullivan. In 1879, Dankmar Adler hired Sullivan; a year later, he became a partner in the firm. This marked the beginning of Sullivan's most productive years. In addition, it was at this firm that Sullivan deeply influenced a young designer named Frank Lloyd Wright, who came to embrace Sullivan's designs and principles as the inspiration for his own work. Adler and Sullivan initially achieved fame as theater architects. While most of their theaters were in Chicago, their fame won commissions as far west as Pueblo, Colorado, and Seattle, Washington (unbuilt). The culminating project of this phase of the firm's history was the 1889 Auditorium Building in Chicago, an extraordinary mixed-use building which includes not only a 3,000-seat theater, but also a hotel and office building. Adler and Sullivan reserved the top floor of the tower for their own office. After 1889 the firm became known for these office buildings, particularly the 1891 Wainwright Building in St. Louis and the 1899 Carson Pirie Scott Department Store on State Street in Chicago. 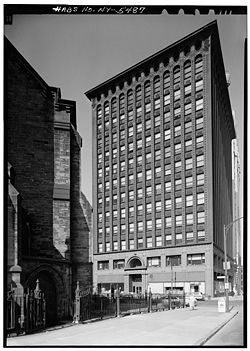 Louis Sullivan is considered by many to be the first architect to fully imagine and realize a rich architectural vocabulary for a revolutionary new kind of building: the steel high-rise. Prior to the late nineteenth century, the weight of a multistory building had to be supported principally by the strength of its walls. The taller the building, the more strain this placed on the lower sections of the building. Since there were clear engineering limits to the weight such "load-bearing" walls could sustain, large designs meant massively thick walls on the ground floors, and definite limits on the building's height. The development of cheap, versatile steel in the second half of the nineteenth century changed those rules. America was in the midst of rapid social and economic growth that made for great opportunities in architectural design. A much more urbanized society was forming and society called out for new, larger buildings. The mass production of steel was the main driving force behind the ability to build skyscrapers during the mid-1880s. As shown by the data below prices dropped significantly during this period. On the other hand, the people in Midwestern America felt less social pressure to conform to the ways and styles of the architectural past. By assembling a framework of steel girders, architects and builders could suddenly create tall, slender buildings with a strong and relatively delicate steel skeleton. The rest of the building's elements - the walls, floors, ceilings, and windows - were suspended from the steel, which carried the weight. This new way of constructing buildings, so-called "column-frame" construction, pushed them up rather than out. The steel weight-bearing frame not only allowed taller buildings, but permitted much larger windows, which meant more daylight reaching interior spaces. Interior walls became thinner, which in turn created more usable floor space. Chicago's Monadnock Building (which was not designed by Sullivan) literally straddles this remarkable moment of transition. The northern half of the building, finished in 1891, is of load-bearing construction. Conversely, the southern half, finished only two years later, is column-frame. While experiments in this new technology were taking place in many cities, Chicago was the crucial laboratory. Industrial capital and civic pride drove a surge of new construction throughout the city's downtown in the wake of the 1871 fire. The technical limits of weight-bearing masonry had always imposed formal as well as structural constraints; now those constraints were suddenly gone. None of the historical precedents were any help, and this new freedom created a kind of technical and stylistic crisis. Sullivan was the first to cope with that crisis. He addressed it by embracing the changes that came with the steel frame, creating a grammar of form for the high rise (base, shaft, and pediment), simplifying the appearance of the building by breaking away from historical styles, using his own intricate flora designs, in vertical bands, to draw the eye upwards and emphasize the building's verticality, and relating the shape of the building to its specific purpose. All this was revolutionary, appealingly honest, and commercially successful. Louis Sullivan coined the phrase "form ever follows function," which, shortened to "form follows function," would become the great battle-cry of modernist architects. This credo, which placed the demands of practical use above aesthetics, would later be taken by influential designers to imply that decorative elements, which architects call "ornament," were superfluous in modern buildings. But Sullivan himself neither thought nor designed along such dogmatic lines during the peak of his career. While his buildings could be spare and crisp in their principal masses, he often punctuated their plain surfaces with eruptions of lush Art Nouveau and something like Celtic Revival decorations, usually cast in iron or terra cotta, and ranging from organic forms like vines and ivy, to more geometric designs, and interlace, inspired by his Irish design heritage. Terra cotta is lighter and easier to work with than stone masonry. Sullivan used it in his architecture because it had a malleability that was appropriate for his ornament. Probably the most famous example of this ornamentation is the writhing green ironwork that covers the entrance canopies of the Carson Pirie Scott store on South State Street. These ornaments, often executed by the talented younger draftsman in Sullivan's employ, would eventually become Sullivan's trademark; to students of architecture, they are his instantly-recognizable signature. 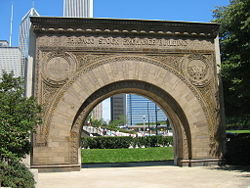 Another signature element of Sullivan's work is the massive, semi-circular arch. Sullivan employed such arches throughout his career in shaping entrances, framing windows, or as interior design. All of these elements can be found in Sullivan's widely-admired Guaranty Building, which he designed while partnered with Adler. Completed in 1895, this office building in Buffalo, New York was visibly divided into three "zones" of design: a plain, wide-windowed base for the ground-level shops; the main office block, with vertical ribbons of masonry rising unimpeded across nine upper floors to emphasize the building's height; and an ornamented cornice perforated by round windows at the roof level, where the building's mechanical units (like the elevator motors) were housed. The cornice crawls with Sullivan's trademark Art Nouveau vines; each ground-floor entrance is topped by a semi-circular arch. Because of Sullivan's remarkable accomplishments in design and construction at such a critical point in architectural history, he has sometimes been described as the "father" of the American skyscraper. In truth, many architects had been building skyscrapers before or simultaneously with Sullivan. Chicago itself was replete with extraordinary designers and builders in the late years of the nineteenth century, including Sullivan's partner Dankmar Adler, as well as Daniel Burnham, and John Wellborn Root, one of the builders of the Monadnock Building. That and another Root design, the Masonic Temple Tower (both in Chicago), are cited by many as the originators of skyscraper aesthetics of bearing wall and column-frame construction respectively. It may be that Sullivan's prominence in skyscraper history can be credited not only to his brilliance, but in some degree to the myth-making skills of his disciple, Frank Lloyd Wright, and to the impact of Sullivan's own book, The Autobiography of an Idea. He may also owe some of his legend to the tragedy of his later years, which lends his story a poignancy which has captured the imagination of student and historian alike. In 1890 Sullivan was one of the ten architects, five from the Eastern US and five from the Western US, chosen to build a major structure for the "White City," the World's Columbian Exposition, held in Chicago in 1893. Sullivan's massive Transportation Building and huge arched "Golden Door" stood out as the only forward-looking design in a sea of Beaux-Arts historical copies, and the only gorgeously multicolored facade in the White City. Sullivan and fair director Daniel Burnham were vocal about their displeasure with each other. Sullivan was later (1922) to claim that the Fair set the course of American architecture back "for half a century from its date, if not longer." (Autobiography of an Idea, 325) His was the only building to receive extensive recognition outside America, receiving three medals from the Union Centrale des Arts Decoratifs the following year. Like all American architects, Adler and Sullivan saw a precipitous decline in their practice with the onset of the Panic of 1893. According to Charles Bebb, who was working in the office that that time, Adler borrowed money to try to keep employees on the payroll. By 1894, however, in the face of continuing financial distress with no relief in sight, Adler and Sullivan dissolved their partnership. The Guaranty Building was considered the last major project of the firm. By both temperament and connections, Adler had always been the one who brought in new business to the partnership, and after the rupture Sullivan received few large commissions, aside from the Carson Pirie Scott Department Store. He went into a 20-year financial and emotional decline, beset by a shortage of commissions, chronic financial problems and alcoholism. He obtained a few commissions for small-town Midwestern banks, wrote books, and in 1922, appeared as a critic of Raymond Hood's winning entry for the Tribune Tower competition, a steel-frame tower dressed in Gothic stonework that Sullivan found a shameful piece of historicism. He and his former understudy, Frank Lloyd Wright, reconciled in time for Wright to help fund Sullivan's funeral after he died, poor and alone, in a Chicago hotel room on April 14, 1924. A modest headstone marks his final resting spot in Graceland Cemetery in Chicago's Uptown neighborhood. A monument was later erected in Sullivan's honor, a few feet from his headstone. Sullivan's legacy is contradictory. Some consider him the first modernist; his forward-looking designs clearly anticipate some issues and solutions of Modernism. However, his embrace of ornament makes his contribution distinct from the Modern Movement that coalesced in the 1920s and became known as the "International Style." To experience Sullivan's built work is to experience the irresistible appeal of his designs, the vertical bands on the Wainwright Building, the burst of welcoming Art Nouveau ironwork on the corner entrance of the Carson Pirie Scott store, the (lost) terra cotta griffins and porthole windows on the Union Trust building, the white angels of the Bayard Building. Except for some designs by his long time draftsman George Grant Elmslie, and the occasional tribute to Sullivan such as Schmidt, Garden & Martin's First National Bank in Pueblo, Colorado (built across the street from Adler and Sullivan's Pueblo Opera House), his style is unique. A visit to the preserved Chicago Stock Exchange trading floor, now at The Art Institute of Chicago, is proof of the immediate and visceral power of the ornament that he used so selectively. Original drawings and other archival materials from Sullivan are held by The Art Institute of Chicago and by the Drawings and Archives Department in the Avery Architectural and Fine Arts Library at Columbia University. Fragments of Sullivan buildings are also held in many fine art and design museums around the world. During the postwar era of urban renewal, Sullivan's works fell into disfavor, and many were demolished. In the 1970s, growing public concern for these buildings finally resulted in many being saved. The most vocal voice was Richard Nickel, who even held one-man protests of demolitions. Nickel and others sometimes rescued decorative elements from condemned buildings, sneaking in during demolition. This practice led to Nickel's death inside Sullivan's Stock Exchange building, when a floor above him collapsed. Buildings through 1895 are by Adler & Sullivan. Bayard Building, (now Bayard-Condict Building), 65–69 Bleecker Street, New York City (1898). Sullivan's only building in New York, with a glazed terra cotta curtain wall expressing the steel structure behind it. By the end of the first decade of the 20th century, Sullivan's star was well on the descent and for the remainder of his life his output consisted primarily of a series of small banks and commercial buildings in the Midwest. Nevertheless, a look at these buildings clearly reveals that Sullivan's muse had not abandoned him. When the director of a bank that was considering hiring him asked Sullivan why they should engage him at a cost higher than the bids received from other architects, Sullivan is reported to have replied, "A thousand architects could design those buildings. Only I can design this one." He got the job. Today these commissions are collectively referred to as Sullivan's "Jewel Boxes." All are still standing. Pueblo Opera House, Pueblo, Colorado. 1890–1922. Destroyed by fire. New Orleans Union Station, 1892. Demolished 1954. The Trading Room from the Stock Exchange was removed intact prior to the building's demolition and was subsequently restored in the Art Institute of Chicago in 1977; the entryway arch (seen at right) stands outside on the northeast corner of the AIC site. Transportation Building, World's Columbian Exposition, Chicago. Adler & Sullivan. 1893–94. An exposition building, it was only built to last a year. Louis Sullivan Bungalow, destroyed in Hurricane Katrina. Frank Lloyd Wright also claimed credit for the design. Schiller Building (later Garrick Theater), Chicago. Adler & Sullivan. 1891–1961. Third McVickers Theater, Chicago. Adler & Sullivan. 1883?–1922. Thirty-Ninth Street Passenger Station, Chicago. Adler & Sullivan. 1886–1934. Standard Club, Chicago. Adler & Sullivan. 1888–1910. Pilgrim Baptist Church. Adler & Sullivan. 1891–2006. Destroyed by fire, Jan. 6. Wirt Dexter Building. Adler & Sullivan. 1887–2006. Destroyed by fire, Oct. 24. George Harvey House. Adler & Sullivan. 1888–2006. Destroyed by fire, Nov. 4. Sullivan, Louis. The Autobiography of an Idea. New York City: Press of the American institute of Architects, Inc., 1924.